We are proud to announce our new Vendor of the Month initiative here at FoodtoEat! Starting on April 1st, every month we will be highlighting one of our favorite vendors whose food we love and who we think our clients will love too! We are hoping to give these vendors more exposure by offering a specialty menu item that is chosen by the vendor and only available to FoodtoEat clients during the month of April! We will also be giving a little background about the vendor and how they got started for our clients to get a better understanding of the people and places that create their food. This month, we are so excited to offer a custom menu item from Veselka to our clients! 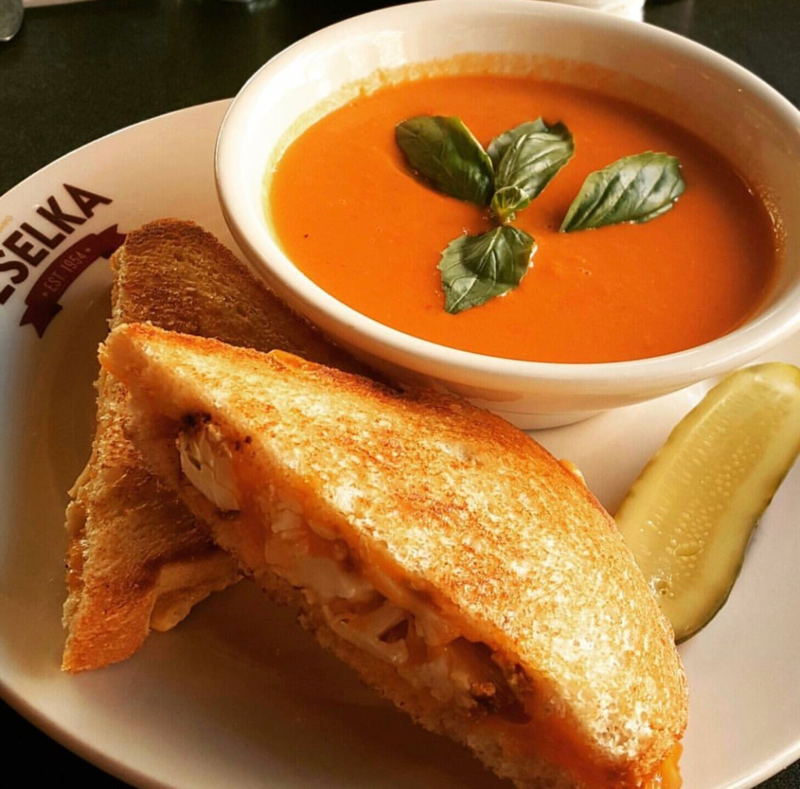 Veselka will be creating a special that includes your choice of a vegetarian grilled cheese (Havarti cheese, roasted beets, walnut pesto on 7-grain bread) or a meaty grilled cheese (Muenster cheese, Baczynsky’s county ham on pullman loaf), each served with a bowl of classic, creamy tomato soup. If you aren’t already familiar with Veselka, it is a New York City staple. It was founded in 1954 and since then has grown into a landmark Ukrainian restaurant in the East Village, serving its famous pierogies, borscht, goulash and stuffed cabbage! Originally founded as a Ukrainian coffee shop that served simple soup and sandwiches, in 1990 it grew into a 24-hour location, serving the dishes that it is known for today. In 2004, Veselka celebrate its 50th anniversary and in 2009, released their first cookbook! It is currently owned by the founder’s son-in-law, Tom Birchard, and is managed by the founder’s grandson, Jason Birchard. Together Tom and Jason make sure that the original family tradition that Veselka was founded on is kept alive! Don’t miss your chance to take advantage of this awesome special! It’s the perfect way to celebrate National Grilled Cheese Day with your team on Thursday, April 12th! Email catering@foodtoeat.com to order your April grilled cheese and tomato soup from Veselka! Next Entry:Lights, Camera, Cinco de Mayo!